As we drift toward the end of the year, I am filled with gratitude for all of my fellow board members whose devotion to our cause never wavers or stalls. In turn, how can we possibly thank all of you who give so generously each year to ensure that all women in Kansas can pay for abortion services? Your gifts make a profound difference in peoples’ lives. Thank you for giving them a second chance. It’s been a busy year, indeed. Peggy Bowman, our namesake, passed away peacefully in July and we’ve dedicated this newsletter to her and her tireless work for reproductive justice. 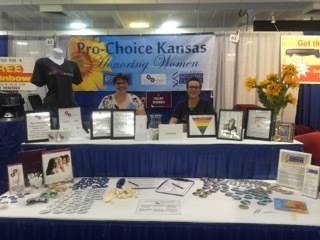 In September, with the help of TrustWomen, we once again staffed the only pro-choice booth at the Kansas State Fair for 10 days, 12 hours per day. It’s of enormous importance that we maintain a presence there because three anti-choice booths also participate in the fair. Thank you to Planned Parenthood, League of Women Voters, the First Unitarian Universalist Church of Wichita, and Kansas NOW for also sharing staffing duties. Finally, we recently launched a new database to streamline our day-to-day functions and to keep us on a path of growth. It’s a great way to end 2016. Peggy Bowman passed away July 7, 2016, of heart failure. Her condition was undoubtedly aggravated by the catastrophe known as San Brownback and Kris Kobach. Peggy grew up on a farm with her parents, two sisters and a brother. A graduate of James Madison University, Peggy started her life in a traditional role as a biology teacher, wife, and mother. Midway through life, she evolved into a fierce advocate for women's rights. Following a move to Wichita, Peggy applied with Planned Parenthood and the rest is history. After working her way up to the Executive Director of PP, she became a lobbyist for Dr. George Tiller. Peggy was the face of abortion rights in Wichita. During the 1991 Summer of Mercy, Peggy was on the front line. Peggy lobbied in Topeka, led rallies, handled reporters and worked the Kansas State Fair--anything to get the word out that women matter. 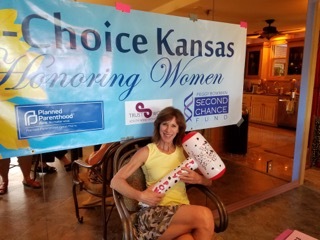 After her retirement from Dr. Tiller's clinic, she was honored by the naming of the Peggy Bowman Second Chance Fund, a non-profit organization that makes abortion accessible to women who could not otherwise afford it. In May of 2016, Peggy was inducted into the Greater Kansas City Women's Political Caucus Hall of Fame. A woman of many talents, Peggy chronicled the extremism and violence of the 1991 siege on the Tiller clinic in her book Fetus Fanatics. She also contributed to Radiating the Stone, an anthology of essays from Wichita's greatest feminists. Above all, Peggy loved her children, her grandchildren, Barefoot wine, liberal politics, good food, friends, all things sports (especially tennis) and MSNBC. obliterate women out of existence, into servitude. of their own devising as justification for their laws. decide how she must fulfill her destiny. As we always mention, for the 21 years our fund has existed, it has been and continues to be run by volunteers. Please be patient as we upgrade our donor records -- from Excel spreadsheets to a great donor database called Donor Snap. If we can correct how we send your information or to whom it is addressed, please let us know by emailing ‪director@pbscf.org . We only send communications 3-4 times per year and never share your information. Your privacy is important, your continued support is vital, and we sincerely thank you for helping Kansas women and families." “I feel like I have another chance at my life again because you helped me with funding for my abortion. Thank you so much!"